Bratty boy gross-out comedies may have been done to death, but Will Ferrell and John C. Reilly bring something new and different, and decidedly whacked out with Step Brothers, by adding hairy chests and whiskers into the suburban preteen angst mix. Tossing together perpetual coming of age issues with radically stunted mental maturity and weird slacker midlife crisis, this Adam McKay (Talladega Nights) directed nutty fare grabs attention through sheer ballsy kid impersonation by these overgrown instant sibling geeks and maladjusted mini-morons. Ferrell is Brennan, a blissfully unemployed thirty-nine year old still living at home with his overly indulgent divorced mom, Nancy (Mary Steenburgen). When Nancy gets it on with Robert (Richard Jenkins), a widowed doctor she meets at a public lecture of his after she catches him checking out her anatomy, the two aging lonely lovebirds decide to get married. 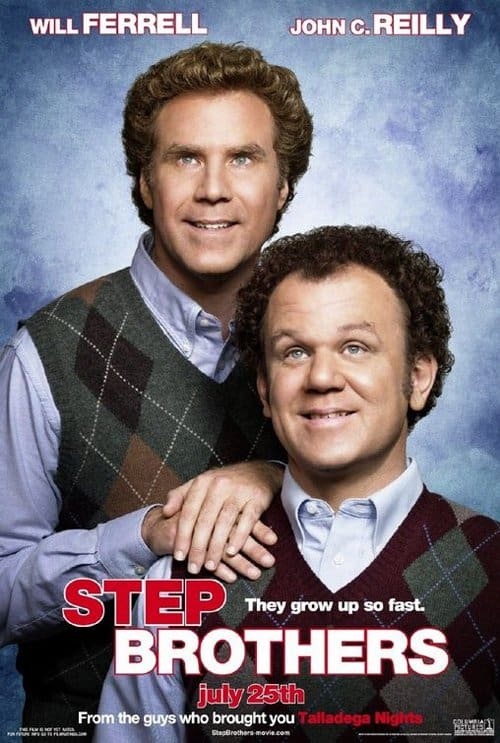 Robert also has a permanent live-in kid at home, fortyish Dale (John C. Reilly), and when newlywed Nancy moves in with Robert, the two brand new siblings are acutely distressed and anything but ready to engage in brotherly love, to say the least. Mutual silent sulking soon turns into outright territorial warfare for these spoiled baby-men not used to sharing their parents, toys and secret stash of magazines, let alone the same childhood bedroom. While whining Brennan blames his maternal neediness on the perpetual post-traumatic stress of a grade school play in which he performed in drag and was accused of possessing a ‘mangina,’ spoiled rotten Dale has no patience for this intruder. Especially when Brennan does a get-even by wiping his private parts all over his super-hated stepbrother’s beloved drum set. There is a temporary time-out truce, when their parents read them the riot act and demand that the two lazies go out and find work, or else. And not ever having been particularly in tune with the real world, the two goofy guys show up in tuxedos to apply for jobs cleaning toilets. Then the plot decidedly sickens when Brennan is sent off to therapy and makes lewd advances towards his female shrink, while Dale gets raped and deflowered in a john by his horny sister-in-law, who also has a preference for relieving herself in male urinals, don’t ask. While Step Brothers, produced by Judd Apatow, who else, tends towards repetitious and over the top crude antics, there’s enough inventive pretend kid malice to sustain the laughs for the duration. Think Superbad with ample doses of talking dirty sibling revelry.